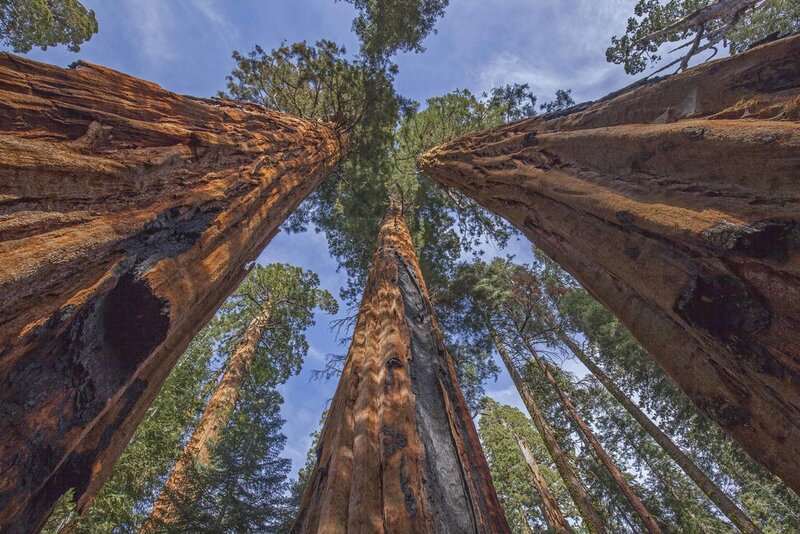 Giant sequoia (Sequoiadendron giganteum) is one of most iconic species on Earth. Restricted to approximately 70 isolated groves in the Sierra Nevada mountains of California, giant sequoias are the largest and among the oldest and tallest tree species in the world. However, their continued existence may be threatened by climate change. As global temperatures continue to rise, droughts are becoming hotter, which exacerbates the drying effect of reduced water. These “hotter droughts” are already causing widespread tree mortality events in many regions and are expected to increase in frequency and severity in the coming decades. As a preview to the future, California’s 2012-2016 hotter drought was considered to be the most severe in at least the ~120 year instrumented record, and potentially much longer. More than 100 million trees in the state died due to a combination of physiological stress and beetle attacks, and many hundreds of millions more underwent substantial desiccation. While relatively few giant sequoias succumbed to the drought, the relative wetness of sequoia groves declined, and many sequoias experienced previously unobserved levels of foliage dieback. To take advantage of this opportunity to learn how giant sequoias respond to hotter droughts, in 2015 I joined a collaborative team composed of researchers from UC Berkeley/California Academy of Sciences, National Park Service, US Geological Survey and Carnegie Airborne Observatory to begin the “Leaf to Landscape Project.” This project aims to improve our mechanistic understanding of giant sequoia vulnerability to hotter droughts and produce empirically derived maps of vulnerability to help managers prioritize prescribed fire treatments to improve forest drought resilience. We found large spatial variation in foliage dieback and remotely sensed canopy water content across the landscape. We also found that although most giant sequoias were experiencing extreme levels of water stress, leaf- and crown-level adjustments were generally effective in helping them to reduce water losses and maintain whole-tree hydraulic integrity. We are now building on these findings to gain a better understanding of how the 2012-2016 drought impacted the growth of giant sequoias, how growth impacts are related to canopy water content and foliage dieback patterns, how strongly giant sequoia growth responded to this recent drought compared to past known droughts, and how they might now be recovering. This information will allow us to better predict how giant sequoias might respond to climate change and improve the capacity of managers to proactively protect and conserve these iconic trees and forests into the future.